Kavanagh says he would like to see both Taylor and Conlan on the undercard of McGregor-Mayweather. 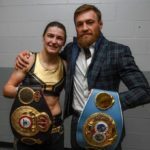 I’ve seen a lot of speculation and I think it would be crazy of the promoters not to put on the likes of Katie Taylor and Michael Conlan…That just seems like a no brainer to me. Why wouldn’t you have a big America vs Ireland? It would generate such interest.